Flint launched an ambitious project to restore residents’ faith in their water in February 2016, hiring contractors to replace every lead and galvanized steel water service line beneath the sprawling city. It was a big, expensive effort following the infamous contamination of the city’s water supply in 2014. The project, which relies on $167 million from state and federal sources, is being closely watched by municipal leaders throughout Michigan who also must replace aging infrastructure. Nearly three years later, Flint has swapped out more than 7,600 lead pipelines for safer lines made of copper. But progress slowed this year and costs are soaring because Mayor Karen Weaver dramatically changed contracting practices. That’s prompted a feud with the state of Michigan, which is threatening to stop funding unless Flint reverts to old, less expensive methods for detecting lead pipes. “Flint’s decision was unreasonable and could not be explained as an attempt to protect public health,” Michigan Assistant Attorney General Richard Kuhl wrote to Flint officials in a letter this month. The issue shows just how difficult it is to replace lead lines in cities as big as Flint, whose population is 96,000, even when funding is guaranteed. Michigan had nearly 460,000 lead service lines as of 2016, and city officials statewide are forming plans to replace them following changes to state rules adopted following the Flint water crisis. In Flint, city officials aren’t sure where lead pipes are located, and Weaver says she’s opting for caution by requiring contractors to dig trenches throughout the city looking for them. Michigan officials and environmentalists say that wastes time and money when other, more precise methods of detection are available. The project is partially funded by a 2017 legal settlement that requires Michigan to reimburse Flint up to $97 million to find and replace lead pipes hooked up to Flint’s 28,400 homes with active water accounts. Attorney General Bill Schuette’s office this month warned Flint it would suspend reimbursements, arguing Weaver’s approach is wasting money. The Natural Resources Defense Council, which helped represent Flint residents in the legal settlement, offers its own criticism. “The City’s illogical approach means that hundreds of lead and steel pipes will likely stay in the ground and in use, and Flint families will remain in harm’s way in the meantime,” Cyndi Roper, the group’s Michigan senior policy advocate, told Bridge Magazine in a statement. One fundamental challenge of removing every lead line in Flint: finding them. Rough estimates suggest more than 20,000 pipelines initially needed replacing, and more than 12,000 remain. The rest are likely copper, which is considered safe. So where should contractors dig? Flint initially relied on a University of Michigan algorithm that predicted the likely location of lead lines. Officials used the data to determine where to send hydrovac trucks, which dig small holes with high-pressure water, to confirm the makeup of a pipeline. Costing little more than $200 per address, the trucks had been touted as an effective, low-cost investigative tool; When they found copper, contractors could avoid the cost of digging a trench. But Weaver changed the plan in 2018. Calling the previous plan risky, she cancelled a $2 million hydrovac contract and required 10-foot trenches everywhere, costing a minimum of $1,700 per home. The new plan means Flint is digging up more copper lines, only to rebury them. From 2016 through 2017, Flint explored service lines at 8,833 homes across the city and found 6,228 potentially hazardous service lines to replace, according to city figures. That’s a “hit rate” of nearly 71 percent. 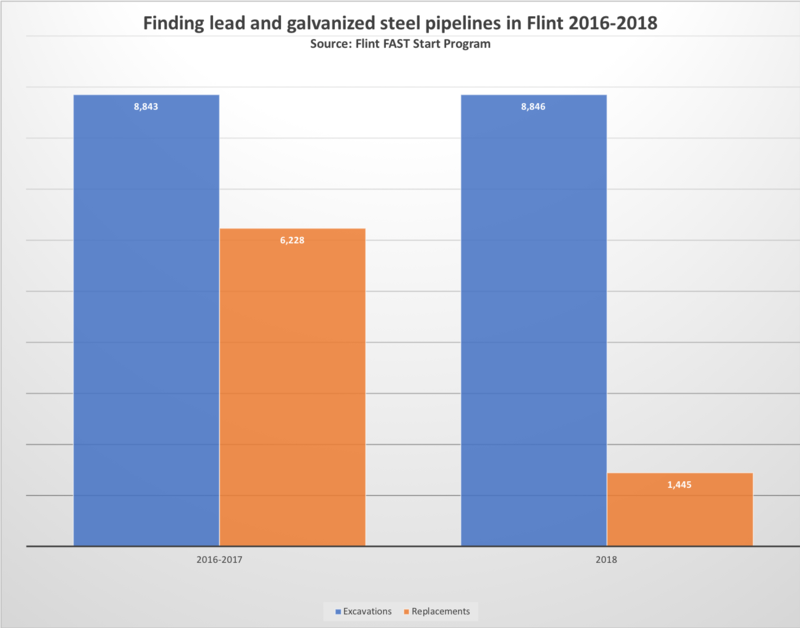 This year, Flint found lead or galvanized steel at 16 percent of homes where contractors dug, replacing 1,360 of the 8,410 pipelines it investigated. In a Nov. 1 letter, Kuhl, the assistant attorney general, accused Flint of violating the settlement agreement by rolling out a “random excavation plan” with little regard for where lead and galvanized steel lines stretched. Under Flint’s current plan, “a real possibility exists that not all lead and galvanized steel lines in the City will be identified and replaced,” Kuhl wrote, and Michigan won’t resume funding unless Flint addresses the concerns. Weaver, who did not respond to questions from Bridge Magazine, has rebutted the state’s criticism, saying she ditched the hydrovac trucks out of caution. The small hydrovac holes initially failed to detect lead or galvanized steel on at least seven pipelines where different metals were spliced together, she said in a press release. The only way to assure assure lead line is replaced, she suggests, is to dig the wide trench everywhere. “Once again, I find myself having to defend why putting people over profit is the right thing to do,” she said in a statement. “I find myself saying, again, that EVERY life in the city of Flint matters to me and I will not buckle on my position. But as Flint spends more time digging up copper lines, it’s more slowly removing lead lines, critics say. “The City’s mismanagement of its pipe replacement program is a disservice to Flint residents, who have already been waiting far too long for their hazardous pipes to be removed,” said Roper of the Natural Resources Defense Council. Flint City Councilwoman Katie Fields told Bridge she has many concerns about the pipeline replacement project and what would happen if the state doesn’t resume funding. She wants more information about what’s behind the changes and whether they’re designed to benefit any of the five contractors dispatched across the city. But Fields said she is struggling to get answers from city executives. Joe Parks said he also wants answers from city officials. He’s project manager for Flint-based Goyette Mechanical and roughly estimates his crews could have replaced 150 more lead pipelines this year had they been allowed to use hydrovacs. The tools are safe and effective at digging around gas pipelines or other infrastructure. Aside from cancelling the contract to investigate pipelines using the hydrovacs, the mayor also ordered Goyette to stop using them in its trench excavations. “Every time I reach out for answers, I receive nothing — it’s radio silence,” said Parks, who figures he’s now run up at least $350,000 in unnecessary costs as a result of the decision. Other City Council members blame the state for threatening to withhold funding. The chain of blunders that exposed Flint residents to lead is now well-known. An emergency manager appointed by Snyder switched the city’s drinking water source from Detroit’s system to the Flint River in 2014, saying it would cut costs. 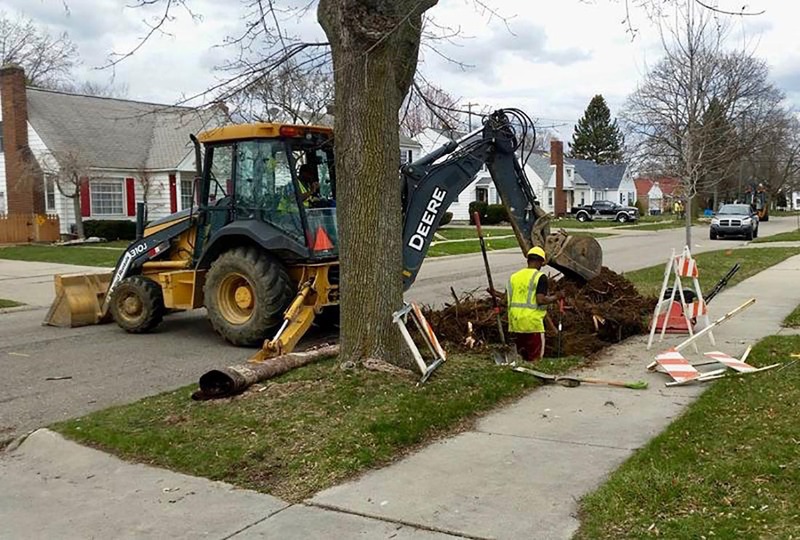 The Michigan Department of Environmental Quality approved the change – but didn’t require treatment to control corrosion of aging water mains. Highly corrosive river water then rusted the mains, leaching lead into drinking water. DEQ regulators first ignored the problem, then tried to discredit whistleblowers before the episode swirled into an major scandal that ultimately forced the state to address its failures. Snyder’s administration this year declared Flint’s water “restored” following repeated tests below the federal government’s lead action level, and the state ended distribution of free bottled water. Snyder, a Republican, is set to leave office on Jan. 1. His successor Gretchen Whitmer “is reviewing a number of issues relating to Flint, including water line replacement issues” and will consult with Attorney General-elect Dana Nessel, a fellow Democrat, once they are sworn in, said Whitmer spokeswoman Clare Liening. Snyder’s optimism hasn’t restored Flint residents’ faith in state government — or their taps. The pipeline replacements aim to change that, but pinpointing the lead lines hasn’t been easy. Records of Flint’s buried pipelines were a scattered mess when National Guard Brig. Gen. Michael McDaniel volunteered to lead the replacement effort in 2016, a post he held through 2017. “We were groping around in the dark,” he told Bridge earlier this year. That changed, McDaniel said, after a group of University of Michigan researchers constructed a model that could predict lead risks by entering such factors such as a building’s age, size, location and value. The algorithm grew more accurate as Flint replaced more pipelines and fed it more data, ultimately achieving an accuracy rate of 94 percent. Flint stopped seeking the university data team’s pro bono expertise in 2018 after signing a $5 million contract to hire a private engineering firm — Los Angeles-based AECOM — to coordinate pipeline replacement efforts. Now, the city is still digging up thousands of pipelines, but fewer are made of lead. Flint’s lead hit rate this year, in fact, was significantly below random chance, according to a statistical analysis by Eric Schwartz, a University of Michigan marketing professor and data expert who helped develop algorithm Flint originally used. “You know something is seriously wrong when digging up service lines randomly would find more lead pipes than the city’s current approach,” Melissa Mays, a Flint resident and a plaintiff in the pipeline settlement case. AECOM used some data generated by the University of Michigan researchers but faced a number of constraints, Wong said. That included city policy. Beyond banning hydrovacs, Weaver also directed AECOM to spread work evenly throughout 10 zones of the city — so as not to favor one ward over another. That meant contractors couldn’t concentrate resources on all neighborhoods most likely relying on lead lines. Regardless, Wong said pinpointing lead service lines would naturally get harder as more work is done. “We know the cost per address is probably going to go up in the last stages, because we’re going to be jumping around, trying to find the needle in a haystack,” he said. But will the money be there? Even before Michigan halted reimbursements in November, Michael Chee, an AECOM spokesman, acknowledged the $97 million legal settlement might not cover the full tab of excavations at every Flint home. “We know there’s going to be a shortfall. We don’t know what that’s going to be, but we’re going to be fairly close,” he said. I have lead pipes from the water line to my house in Grosse Pointe Park, what is the State going to do for me and other tax payers. Grosse Pointe Park could easily fund lead pipe replacement. The median income is over a $100,000 per year. The median housing value is $355,400. The state of Michigan is funding this program in Flint because their emergency manager and state administration unwisely changed the water supply without sufficient planning and knowledge of the water system. It was an easily avoidable and irresponsible act that caused significant harm to the water infrastructure and the people it serves. But I suspect you know all this and your objections are more about who is being helped and less about unjustified costs to other taxpayers. Sounds like the Flint Mayor's Friends and Family Plan. But after all this, one has to wonder what about the pipes within the individual homes. The Detroit School Superintendent shut down water delivery in the school when lead was found in the dispensers within the buildings. Don't the individual faucets in Flint behave the same way. I know for a fact that Habitat for Humanity no longer accepts used plumbing fixtures because of a lead fear. Yep he did as required by law>> but in Flint ths governor ordered all testing of the water STOP!! And the schools are new built by Englers buddys Barton-Mallow!!! The ones who built a football filed for Cass tech 90 yeard long!!! AND GOT PAID!!! Lansing found, removed and replaced lead pipes even while having Virg as mayor. Karen the Crook Weaver just can't make Flint work. But when a city has council members pawning city laptops to make their bar tab, by all means, blame the state and the governor. Focus on the idiots in Flint. Don't make any excuses for them. Then the problems will solve themselves. Your statement that Flint "Michigan had nearly 460,000 lead service lines as of 2016," is a bit off I believe. I think they started with about 15,000 or so. Thank you guys at Bridge for continuing to report on the Flint water crisis long after the corporate media has moved on. Jordan Chariton from Status Coup has also done some informative reporting on the subject. You guys are great. This article is the most important piece of environmental journalism that I've seen on the matter of the remediation of lead service lines in Flint in the last six months. The Mayor of Flint's irresponsible conduct in disallowing hydro-excavation methods for identifying and locating lead service lines and failing to use predictive models for targeting service line locations for such identification are signs of technological incompetence by the City of Flint in carrying out city-wide environmental remediation of the service line problem. There is another story though that needs to be told about this issue for the operation of how Flint's lead service lines are replaced once they are identified. The City of Lansing, MI and its Lansing Board of Water and Light have achieved 100% changeover of lead service lines to copper using innovative construction techniques that limit surface disturbances and required house basement to street excavations....leading to service line replacements conducted at a fraction of the cost and disturbance compared to techniques used in Flint. This was carried out under the leadership of the former Mayor of Lansing, Virg Bernaro. Lansing Board or Water and Light personal went to Flint to teach this technique to city water staff early on in the Flint water crisis, but ultimately Flint leaders rejected this innovative method in favor of far more expensive and time-consuming traditional full basement to street excavation technique used by Flint's present contractors. Bridge Magazine should consider an article highlighting Lansing's achievement in full replacement of lead lines and Flint's rejection of Lansing Board of Water and Light's innovative methods and the cost of that rejection in both financial terms and potential failure to get to 100% of all of Flint's lead service lines. Lansing spent about $42 million to replace about 14000 lead service lines beating the efficiency performance of what is presently going on in Flint by far which is still far from replacing 100% of all of its service lines. More recently, Flint full excavation techniques have also run into problems with parts of the city having evidence of Native American burials and interaction between those issues and federal money being provided....a problem which would be minimized or eliminated by using Lansing BWL's innovative techniques. There are so many more efficient and economical ways of lead abatement. One that I haven't heard of being utilized is a water service lining technique. A very shortened explanation is that after cleaning the inside of an existing service line, a very thin yet incredibly strong poly liner is pulled through the service and an epoxy permanently bonds the liner in place, creating seperation between water and lead. Very little excavation required and much cheaper than any other method. This could also address the partial lead/galvanized lines the article talked about as well. If lead/galvanized is identified in the home at the water meter, but copper is found at the curb stop valve near the street, you would not have to dig trenches to find the change in material or renew the entire service, only to find that maybe only a small portion of the line was actually lead/galvanized. The DEQ will not recognize it as an approved method, yet it is used for old water mains that literally have lead "packed" into the joints to hold them together. Another little talked about downside to this massive lead service line replacement effort is the false sense of security it provides. Everyone solely points to the lead lines as the source of contamination, and believe that upon their service being replaced, no risks exsist. No one has mentioned that the interior plumbing in most homes built before 1987-ish used lead soldiered copper pipes. So residents may get a brand new copper service and still test above the State's AL of 15 mg/L. Thus, the false sense of security. The City of Grand Rapids has used phosphate additives in their water since the mid 90's with great results. Instead of the State simply replacing all lead lines to make-up for a mistake they made, maybe they should make better use of taxpayer dollars by using research and more innovative techniques that obtain the same goal, but far more economically. My money says the city will spend money unnecessarily and the problems will persist despite all the digging. My money also says people are getting kickbacks from the mayor's office.